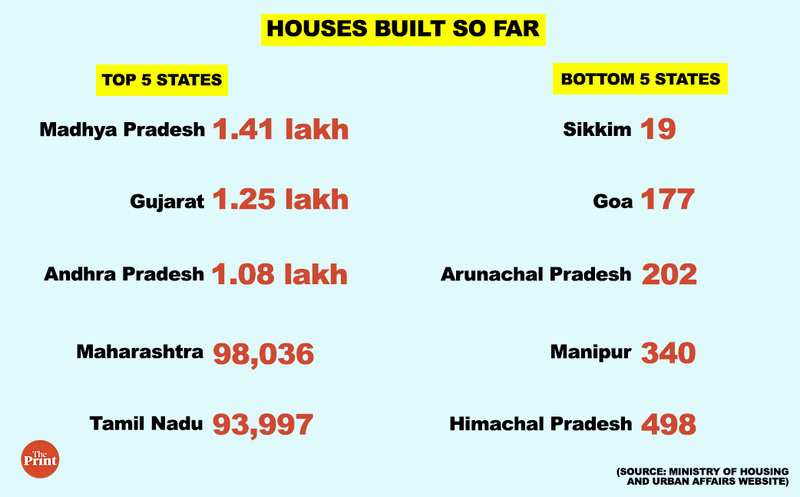 Under PMAY, Modi govt hopes to build 1.2 cr houses by 2022 but so far just 16% of sanctioned homes have been built. New Delhi: The Modi government’s flagship urban housing programme is stuttering three years into its launch as a number of states are yet to claim their share of the funds earmarked for the scheme. This not only has the potential to hurt the Modi government politically but is also imposing a financial cost on the central government as it is paying an interest of 8.4 per cent on Rs 8,000 crore it had borrowed to fund a part of the ambitious programme. Under the urban leg of the Pradhan Mantri Awas Yojana (PMAY), the Central government was to release its share of around Rs 91,979 crore in three instalments — of 40 per cent, 40 per cent and 20 per cent respectively. According to government officials familiar with the matter, the Union Housing and Urban Affairs Ministry, which is implementing the scheme in urban areas, has so far released Rs 29,842 crore of central assistance to the states between June 2015 and 15 October 2018. This includes Rs 8,000 crore the ministry raised in 2017-18 from Extra Budgetary Resources (EBR), on which it is paying an interest of 8.4 per cent annually. Of the Rs 29,842 crore released so far, close to Rs 28,000 crore was part of the first instalment. The second and third instalments have been trickling out as the states have to submit utilisation certificates (UCs) to avail of these funds. As per PMAY (U) guidelines, the ministry releases the subsequent instalments only after states submit utilisation certificates showing that they have used at least 70 per cent of the earlier Central government funds, along with details of the money that they themselves have to release and information on the progress on the ground. “Many of the states have applied for release of the second instalment but they have not submitted the required documents,” a housing ministry official said. As against the funds disbursed, the ministry has so far received utilisation certificates for Rs 16,000 crore, including Rs 3,000 crore of EBR that it released to the states in March 2018, one of the officials said. “If states are delaying submitting UCs, it could indicate that work on the ground is yet to pick up pace,” a second official said. Such is the ‘slow’ utilisation of the funds, for which the central government is also paying interest, that alarm bells have started ringing in the finance ministry. The impasse could imperil one of the most ambitious social welfare programmes of the Modi government, under which it plans to build 1.2 crore houses by 2022 at an estimated cost of Rs 1.82 lakh crore. As on 15 October, only 9.66 lakh or 16 per cent of the 60.36 lakh houses sanctioned so far, have been completed while 31.7 lakh units are at varying stages of construction, according to data on the ministry’s website. Under the scheme, the Centre is to disburse around Rs 36,791 crore as part of the second instalment but without the states submitting the utilisation certificates, hardly 10 per cent of the money has been released. 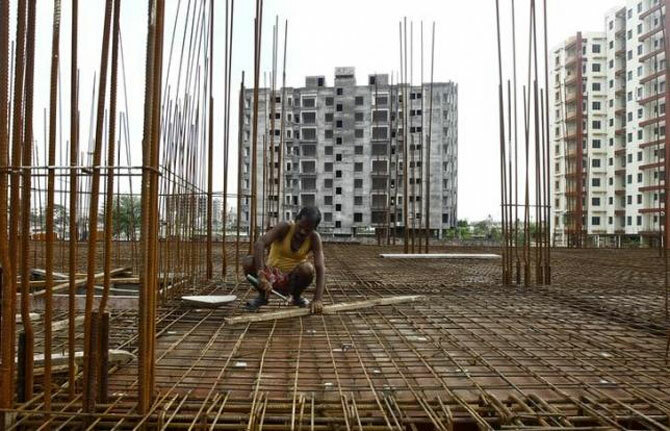 According to figures reviewed by ThePrint, as on 10 September, the housing ministry has disbursed the second instalment of funds worth Rs 1,877 crore to about a dozen states, including Madhya Pradesh, Odisha, Chhattisgarh, Bihar, Jharkhand, Assam, West Bengal and Tripura. Of the nearly Rs 18,000 crore third instalment, the ministry has just disbursed Rs 126 crore as on 10 September. A Haryana government official, who did not want to be identified, explained the issues plaguing the scheme at the state level. “There are procedural delays. Projects are stuck because land is under litigation or because of other technical reason,” the official said. A senior housing ministry official, however, said the progress made by the states was satisfactory, adding that states still had time to submit the UCs. “We are pushing the states to expedite the process and claim the next tranche of funds,” the official said. “Many of them, however, still have time to submit the utilisation certificate as per the government’s General Financial Rules (GFR)”. The GFR rules, followed by all government entities while dealing with matters involving public finance, prescribes that the utilisation certificates are due anywhere between 11 months to 23 months depending on the month of release. For instance, if funds were released in March 2016, the utilisation certificates will be due the next March. But if the fund was released in April 2016, after the close of the financial year, the certificate will be due one year after the closure of that particular financial year in which the ministry released the fund, in effect by March 2018. Earlier this year, however, the Parliamentary Standing Committee on Urban Development raised questions on the poor utilisation of funds in the housing ministry’s flagship programmes, including PMAY, and its interpretation of the GFR rules regarding the utilisation certificates. In its action taken report, submitted in Parliament in July, the committee expressed unhappiness at the “trend of central funds not being utilised”. It also observed that the ministry was giving its “usual excuse of procedural delays” and red-flagged its interpretation of the GFR rules. “…. it is disquieting to note that the reply (housing ministry’s) has tried to project that the utilisation certificates actually due on 31 March 2018, was for funds released up to March 2016, which is not true and is in contravention of the GFR which allows a 12-month period, i.e. up to 31 March, 2017, and not up to March 2018,” the committee had observed in the report. The houses are built under five categories in PMAY. Of these, the Rajiv Awas Yojana (RAY) is a continuation of the scheme launched under the UPA in 2009. The four other verticals under PMAY are the beneficiary-led construction (BLC) where the beneficiary has his own land or house and is given funds to build/upgrade the house; in-situ slum rehabilitation; affordable housing project and the Credit Linked Subsidy Scheme (CLSS). Barring the CLSS category, where beneficiaries, belonging to the EWS, LIG and MIG category, are provided with an interest subsidy, the Centre has to shell out Rs 1.5 lakh per house over the period of the scheme.